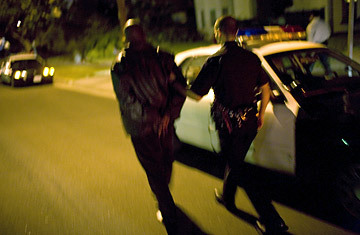 A Los Angeles police officer leads a man suspected of kidnapping to a patrol car. Despite our melting-pot roots, Americans have often been quick to blame the influx of immigrants for rising crime rates. But new research released Monday shows that immigrants in California are, in fact, far less likely than U.S.-born Californians are to commit crime. While people born abroad make up about 35% of California's adult population, they account for only about 17% of the adult prison population, the report by the Public Policy Institute of California (PPIC) showed. Indeed, among men ages 18 to 40 — the demographic most likely to be imprisoned — those born in the U.S. were 10 times more likely than foreign-born men to be incarcerated. "From a public safety standpoint, there would be little reason to limit immigration," says Kristin Butcher, an economics professor at Wellesley College and one of the report's authors. The new report even bolsters claims by some academics that increased immigration makes the United States safer. A second study, released earlier this month by Washington-based nonprofit Immigration Policy Center, found that on the national level, U.S.-born men ages 18-39 are five times more likely to be incarcerated than are their foreign-born peers. And, while the number of illegal immigrants in the country doubled between 1994 and 2005, violent crime declined by nearly 35% and property crimes by 26% over the same period. The PPIC even determined that on average, between 2000 and 2005, cities such as Los Angeles that took in a higher share of recent immigrants saw their crime rates fall further than cities with a lower influx of illegals. Driving these statistics, researchers believe, are the same factors that drive immigration in the first place. "People who make the decision to come here from another country want to get ahead, establish a better life," says Harvard sociology professor Robert Sampson. "That dream is not something they're likely to risk by getting arrested." Sampson and colleagues recently examined more than 3,000 violent acts committed in Chicago from 1995 to 2003, analyzing police records, census data and a survey of more than 8,000 residents. They discovered what Sampson calls the "Latino Paradox" — first-generation Mexican immigrants were 45% less likely to engage in violence than third-generation Americans. This pattern continued into the second generation, which was 22% less likely to be violent. Similar trends have been seen in New York and Miami, both of which have large immigrant enclaves. "Immigrant communities are often responsible for revitalizing the urban neighborhoods that they live in," Sampson says. The irony of people's popular misconceptions, he adds, is "that the longer one is exposed to American culture, the more likely you are to participate in violence." Critics note that studies such as those mentioned above rarely distinguish between legal and illegal immigrants. Reliable data that separates the two groups is hard to find, but Indiana University economist Eric Rasmusen has culled figures from a 2005 GAO report on foreigners incarcerated in Federal and state prisons to calculate that illegal immigrants commit 21% of all crime in the United States, costing the country more than $84 billion. Rasmusen contends the distinction is important because immigrants with a green card or U.S. citizenship have already jumped through several legal hoops to live and work in the U.S., including a background check into any prior criminal record back home. "Legal immigrants are by definition unusually law-abiding," Rasmusen wrote last June. But Professor Daniel Mears, a Florida State University criminologist, argues that such reasoning can also be turned on its head. "If someone is here illegally," Mears asks, "why would they call attention to themselves by committing a crime?" Steven Camarota, research director for the Center for Immigration Studies, which favors tighter immigration controls, warns that even if immigrants are less likely to commit crimes, their children and grandchildren may be more likely to end up on the wrong side of the law. He points out that U.S. Department of Justice statistics show that Hispanics make up 20% of state and Federal prison populations in 2005, a rise of 43% since 1990. At that rate, one in every six Hispanic males born in the U.S. today can expect to be imprisoned during his lifetime — more than double the rate for non-Hispanic whites, but lower than that of African-Americans of the same age. "That means the children and grandchildren of immigrants are committing a lot of crime, making this a long-term problem," Camarota says, before adding, "That's much worse news." Whatever the findings of the latest PPIC research, it will do little to cool the passions on either side of the issue. When debating immigration, says Mears, "it doesn't matter what the empirical evidence shows; people react with their gut feelings first." The original version of this article stated that Daniel Mears is a professor of criminology at the University of Florida. In fact, Daniel Mears is a professor of criminology at Florida State University.